I’m starting to become a fan of Memphis’ smaller green spaces. There are small parks and massive medians scattered around the city that are usually less crowded than the large parks. That’s why I love Peabody Park in midtown. It’s smaller and less crowded than nearby Overton Park, and it’s got some unique features. 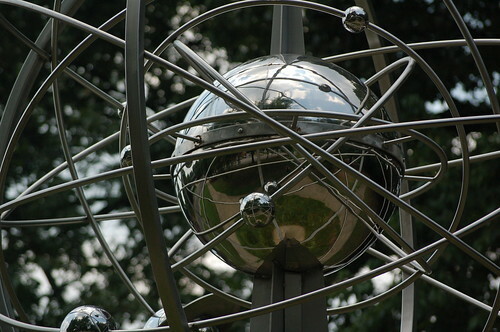 There are two large metal sculptures by local artist Yvonne Bobo, a pavillion, and a large playground. But the best thing about Peabody Park is the splash park. Splash Park at Peabody Park, Memphis, Tenn.
During the summer, it’s packed with kids trying to cool off in the intermittent spray from fountains, geysers, misters and rainfalls. The park is also home to the Raymond Skinner Center, a community recreation center that has special resources for people with mental and physical disabilities. 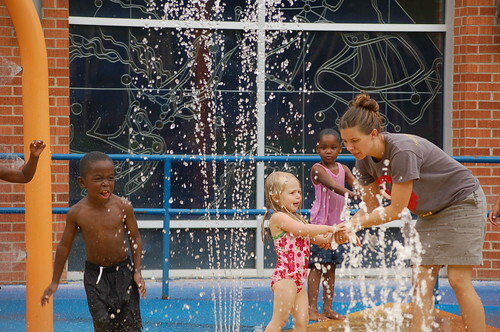 The splash park at Peabody Park is free and open daily during the summer. Thanks for sharing this. I always heard the only splash park was in Collierville. I think Memphis could invest in more splash parks, these are great for little kids and could relieve congestion at the few public pools remaining in Memphis. i was wondering if i could come volunteer for you guys…………………………. This is not the site for the Skinner Center. If you’re interested in volunteering, you might try calling them directly at 901-272-2528.